At the beginning of the second act of “Shazam,” the newest entry in the DC Cinematic Universe, there is a scene where the titular hero, Shazam (Zachary Levi), is outside doing a street performance of some of his superhero stunts for money. His foster brother, Freddy (Jack Dylan Grazer), approaches him to criticize Shazam for not showing up to school to make him look cool. Through this short exchange, there are two very different things going on. Freddy feels seriously betrayed and resents Shazam, in a way that one would expect from a superhero movie with a more dramatic tinge. However, Shazam brushes these criticisms off entirely and just wants to have fun, shooting lightning out of his fingers like a little child. This scene is awkward, clunky and the mismatched tone, while intentional here, just does not really feel like it works. However, in a way, it is also extremely representative of the core tonal mismatch present through “Shazam,” making it yet another swing and a miss from DC. “Shazam” feels as though it is intended to be similar in style to some of the more comedic Marvel movies, such as “Guardians of the Galaxy.” However, where movies like “Guardians” expertly blended comedic elements into more traditional superhero scenes seamlessly, “Shazam” stumbles. Rather than having the two elements work in conjunction with one another through each scene as most of these movies do, it instead feels as though it is a movie split in half; half of those scenes being intended for a stereotypical superhero movie, and half of them being intended for a straight up superhero parody movie. 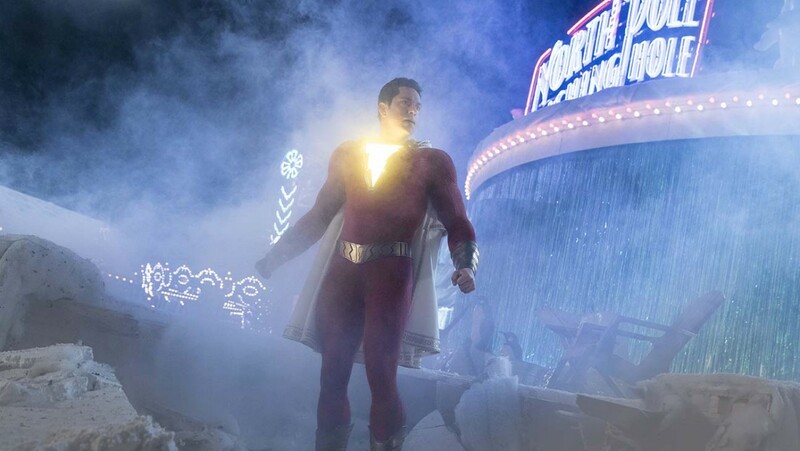 While neither of these elements are bad in premise, the lack of cohesion in the elements results in a deep flaw in the foundation of “Shazam:” it just cannot seem to decide what it is and what it wants to be. That being said, a mismatched tone is not enough to sink a movie by itself. However, what is enough to sink it is the meandering, uninteresting and uninvolving plot. The first act of the movie is a bit of a meandering mess, where it attempts to seemingly present a superhero that is merely intended to parody superheroes, rather than actually be an effective hero. Not only does this entire portion of the movie lack any feeling of story, but it also just does not quite lean enough in on the parody-esque elements like the feeling that “Deadpool” expertly pulled off. Rather, it just ends up feeling like a funny superhero movie that is not going anywhere. This would perhaps work if it were the intended direction of the whole movie, but when the movie starts developing into its actual storyline, it makes the entire first act feel like a waste of time, which is especially an issue with the bloated runtime. As the movie continues along and Shazam keeps discovering more and more of his powers as the plot decides he should have them, he eventually reaches a point where he just seems too powerful with no apparent weakness, or even a character flaw. An effective character, but especially superhero, requires a character flaw: Tony Stark’s alcoholism, Clark Kent’s narcissism and so on. It does not need to be major, but it needs to exist. However, the entire premise of the character of Shazam prevents him from being able to have a character flaw. Billy Batson (Asher Angel) is the chosen one because he has a pure, incorruptible heart. For him to be greedy, or self-centered, or really to have any personality flaw would be to contradict the inherent lore of the world, which makes him an entirely uninteresting hero. His sense of humor makes him somewhat captivating, but it is just not enough to make the future of his character inspiring. Additionally, the overpowered nature of his superhero makes the story simply uninteresting. Obviously, he is not going to lose as it is a superhero origin story, but this never even seems to be attempted to be in question throughout the final sequence. This is especially disappointing considering the relatively short time period over which he grasped his powers: he should not be this in control of his powers this soon after discovering them. He needed to have more moments of genuine struggle using his powers for them to come across convincingly. The mere fact that “Shazam” is a departure from the poorly executed darkness of the early DC Cinematic Universe makes it a seeming step up, and some of the gags they implement are genuinely funny, but DC’s inexperience at using comedic elements in their superhero movies glares through at every corner of “Shazam,” making it a resounding disappointment.